The island of Senja has a very different feel to it that the more ‘pure ice’ areas around Lyngen. The coast brings more fickle weather and the climbing generally has a more ‘Scottish’ feel to it. Though there is surely plenty of ice around, Senja excels in mixed climbing on trad gear, where there are probably near endless opportunities to put up new routes. To say it's 'Scottish' may prompt the question 'so why go all that way? ', well more reliable conditions, epic lines and no other climbers is why. The guru of climbing on Senja is Bent Vidar Eilertsen - a Mountain Guide and owner of Senja Lodge. We won’t go into a load of detail on the climbing here – if you want info check his site: http://senjalodge.com/ (and indeed stay at the lodge, where he will probably be on hand to offer advice). There is already a pdf on the site showing climbs and he is working on an expanded version with maps, and after that an actual guidebook. Rich Cross of Alpine Guides has also visited for the last couple of years (info from 2012, here and here). 2013 UPDATE: Ines Papert visited Senja early in 2013, climbing amongst other things a mega new route with Bent that can be read about here. Here is some brief info on what is around, from just an ice climbing point of view (note, I doubt we really scratched the surface after being plagued with bad weather). Not an Earth shatteringly brilliant route, but not bad at all, and about 3m off the road. A route ending in a pillar on the left (noted as 'WI4' on map), and a route in a cleft with a chock-stone on the right (WI3). 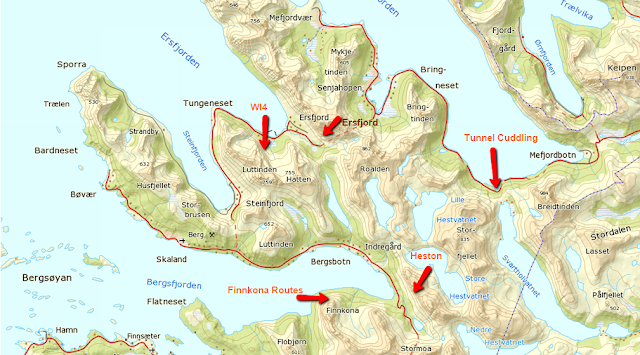 Coming from Senjahopen, as you come out of the tunnel into Ersfjord, there are three routes. The left hand thin ice line is a hard mixed line put up by Rich Cross this year, then the high icefall on the right and the lower pillar further to the right. These, when we tried, had a deceptively long and awkward approach along the edge of the fjord. I am sure it very much depends on snow conditions though. The WI6 is reputed to be a truly amazing route. Visible just before, and from, the switchbacks on the main road through Ersfjord.